What animal is made up of three billiard balls, five feather dusters and dinosaur feet? … An ostrich, of course! In this book, young readers are asked to guess the animal using a list of unexpected bits and pieces as clues. The concept of this book is inspired by the ways old natural histories explained and illustrated exotic animals. Little-known animals were described as a hodgepodge of parts taken from familiar creatures and vegetation. Beavers, for example, were described as being composed of a flounder, an otter, goose feet, squirrel paws and a rabbit’s front teeth. Tricky, right? Well, not to worry! Opening the gatefold will reveal the animal — and lots of cool facts about it! 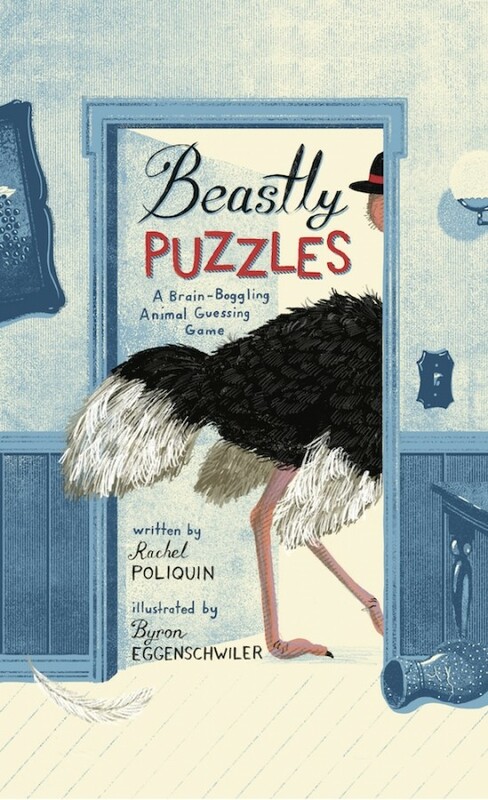 Are you ready for your first Beastly Puzzle? Rachel Poliquin is a writer and curator with a background in visual arts, cultural history and natural history. Rachel has also written for the Believer Magazine and the New York Times. Rachel lives in Vancouver, British Columbia. 20 winners will each receive a hardcover copy of BEASTLY PUZZLES. Cool animals should make for beastly puzzles! This book looks really cute. I know my niece will love it. The cover is really cute. This book sounds like a lot of fun. How fun! This cover is definitely eye-catching. I think the different types of fonts help give it the fun, lively feel to the book. The ostrich is awesome, I love it! The book cover is fun. This book sounds interesting and informative. I love the fun cover and the synopsis sounds exciting and unique.